As Tony admits, his predatory nature steers him toward making loans to people they know cannot pay it back. Then, when heavily indebted, they asset-strip what remains as a consequence and/or control the lives of those they put into debt. Debt slaves of the mob. In the end they wind up destitute and dead. Is the IMF and ECB no different with Greece? Once they strip Greece of all their assets (land,etc), including gold, who doubts they will not just leave the carcass behind and declare Greece a basket case? Where will the loans then come from? Surely once the assets are gone, there will be no need for more loans. In related news, Belarus http://www.zerohedge.com/article/minsk-moment-update-belarus-hyperinflation-prompts-government-freeze-food-prices has now an uninvited visit from the IMF. Quote from the article: "The International Monetary Fund said Tuesday that a mission would visit Belarus on June 1-13 for regular post-program monitoring. Minsk has not applied for IMF funding so far." You can bet the banksters will be making a deal Belarus just cannot refuse. ZH is correct in branding these people (bankers) sociopaths. Is it no wonder people are pissed off? The bear market in social mood ain't over by a long shot, that much I am confident in. 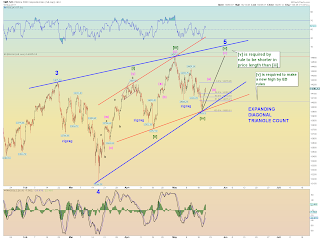 The best evidence of a triangle is a somewhat complex [c] wave that still followed the rules of a 5-3-5 zigzag. Bullish sentiment corrected to certain bearish extremes in some measures such as the AAII survey, the NAAIM survey in those who expect a correction, and the small trader lack of speculative calls as % of total volume. All these have been pointed out by Sentiment Trader the past few days/week. And all suggested a "surprise upside" day was in store. And thus the algo-directed market made it happen after an overnight futures ramp. 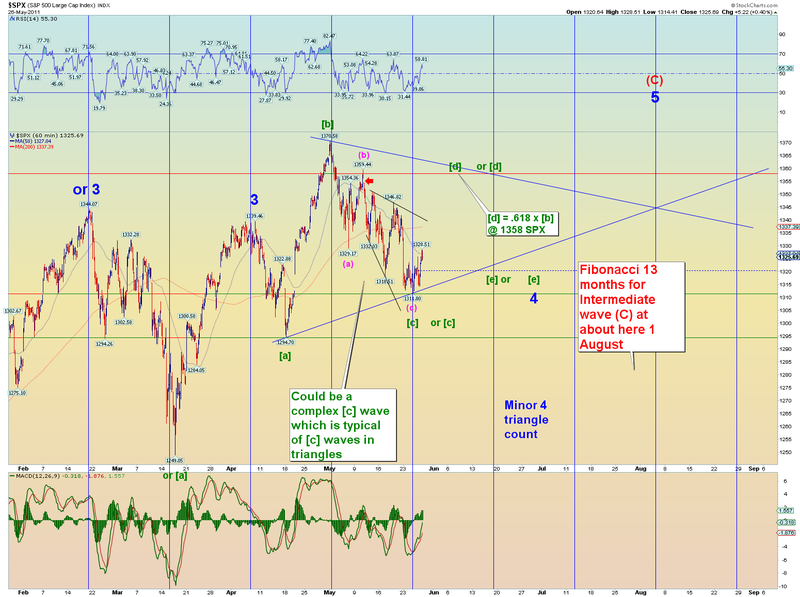 Additionally, the triangle count may give the best Fibonacci timeline for Intermediate wave (C). Intermediate (A) was more or less 13 months, it would be fitting if (C) was equal in time to (A). Why? Because in a zigzag wave relationship, wave (C) usually relates to wave (A) in Fibonacci terms in either price or time. The best opportunity for price was (C) = .618 (A). 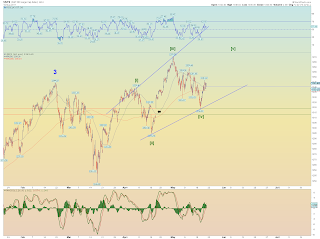 That has come and gone somewhat and for instance the Wilshire (C) = .652 (A) at the recent peak. So rather than price, perhaps the time factor is involved instead. And without doing the exact math, if (C) lasted as many trading days as (A) we are looking at the middle of July as a peak for (C). 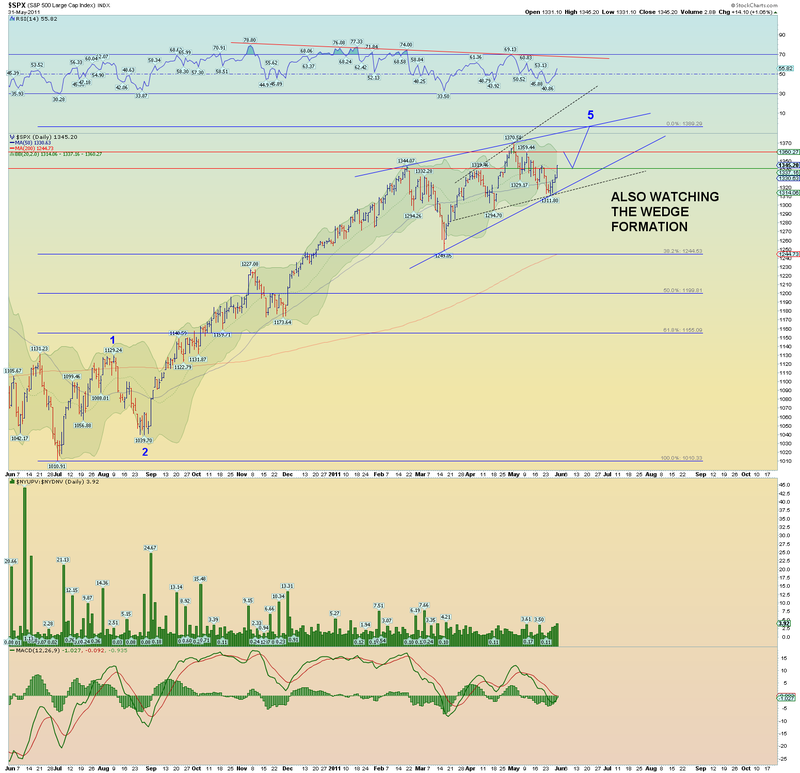 The triangle gives us the best chance to meander and achieve this time ratio without too bullish a price, too quickly. This count isn't really a count at the moment as much as a pattern. 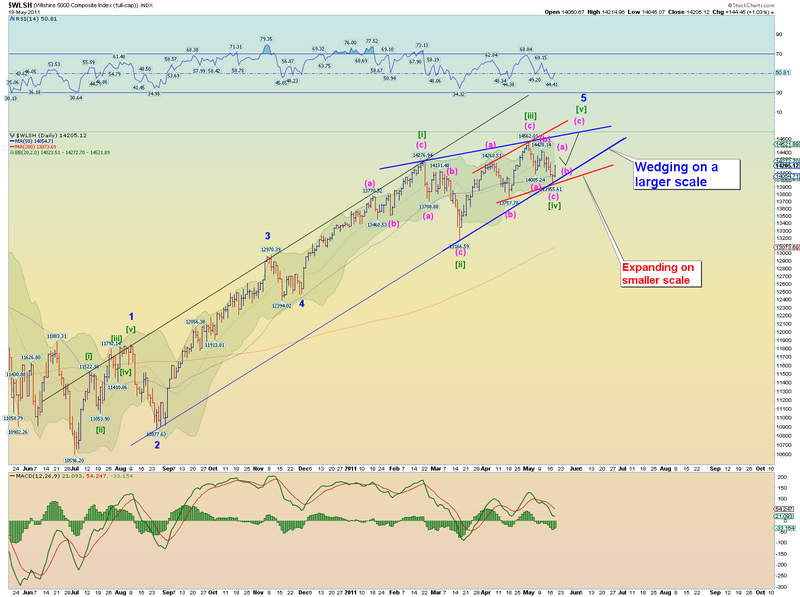 A quick burst to the upper line using an (a)(b)(c) move (this aspect is important to it being a wedge) formed by recent peaks may be in order for the market. 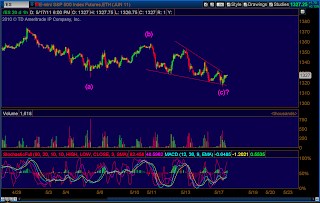 This move would look somewhat similar to a triangle move but be much quicker and have differing price points. The wedge may overthrow and result in a true turnaround day where people realize, enough is enough and the market, versus fundamentals, is just getting silly. 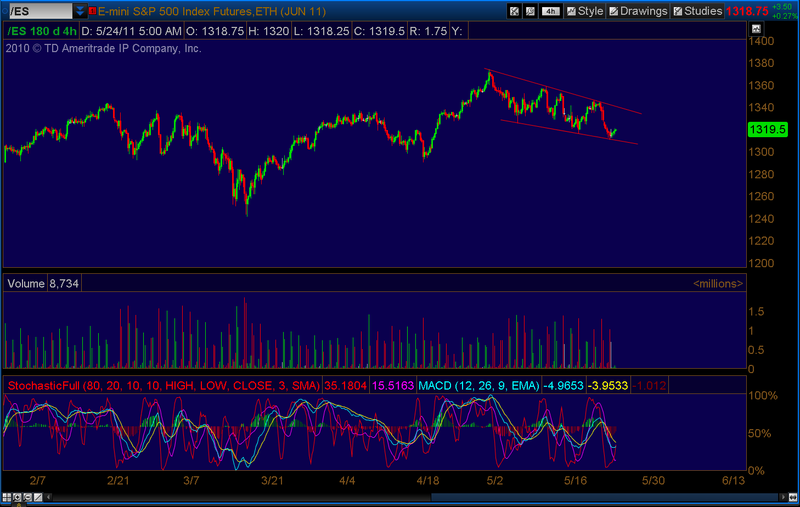 Of course, the mark of a wedge is that prices collapse to back under where the wedge started in quick fashion. 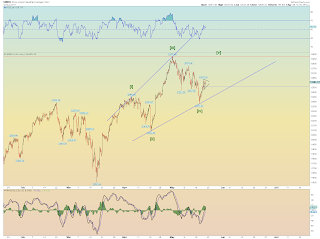 And that would be under 1250 SPX. So we eagerly await. 3. LEADING DIAGONAL COUNT DOWN. 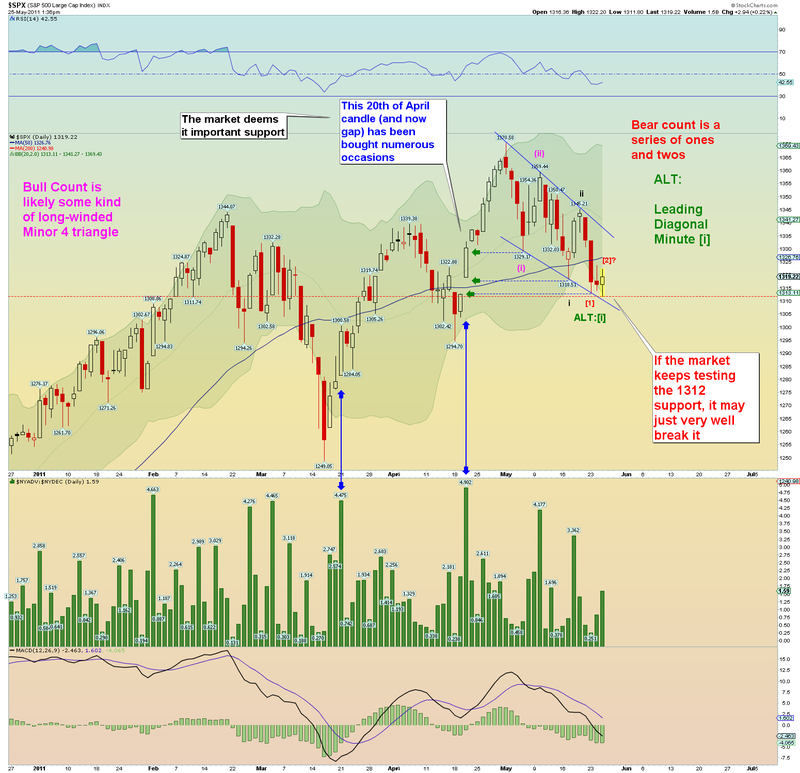 Price action and technicals don't really lead one to believe we have a LD count down. The wave evidence also is extremely suspect. 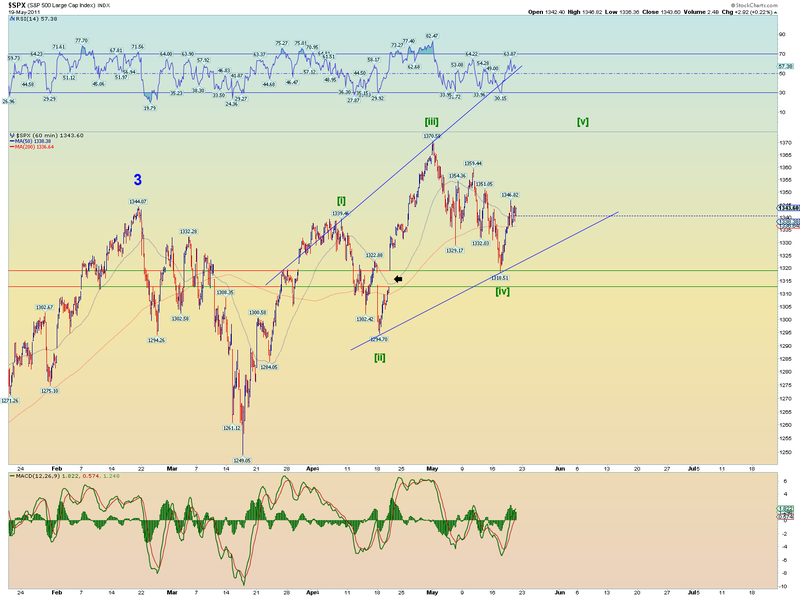 But new highs are certainly not necessarily in the cards for all indexes or any indexes for that matter. 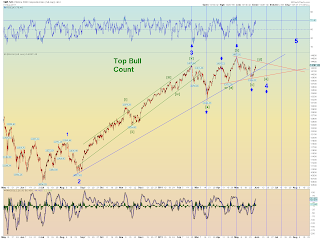 So we'll keep this on the count board just to say we haven't forgotten the top bearish count. Absolutely nothing has been fixed since he said that. [Update 7PM] Still using the NYAD count for clues to the entire wave structure. New All-time high today. Yet I will note that again, the day ended less than 4:1 up volume ratio. We haven't been able to muster a day more than this since early March. 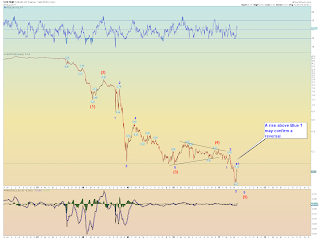 The weakening "lower highs" downtrend in bullish days is consistent that the market is in the latter stages of the nearly year long proposed (C) wave. [Update 6:05PM: Wedge formation is also on the radar where a persistent uptrend again displays itself all the way to the upper trendline. This price action would force the bearish surveys (for instance the bearish AAII and low call volume from small traders) and what not as of late to flip bullish much quicker. Time will be shortened and price points would be different than the triangle below, but the basic moves would be similar. Triangle Minor 4 count is the preferred count. 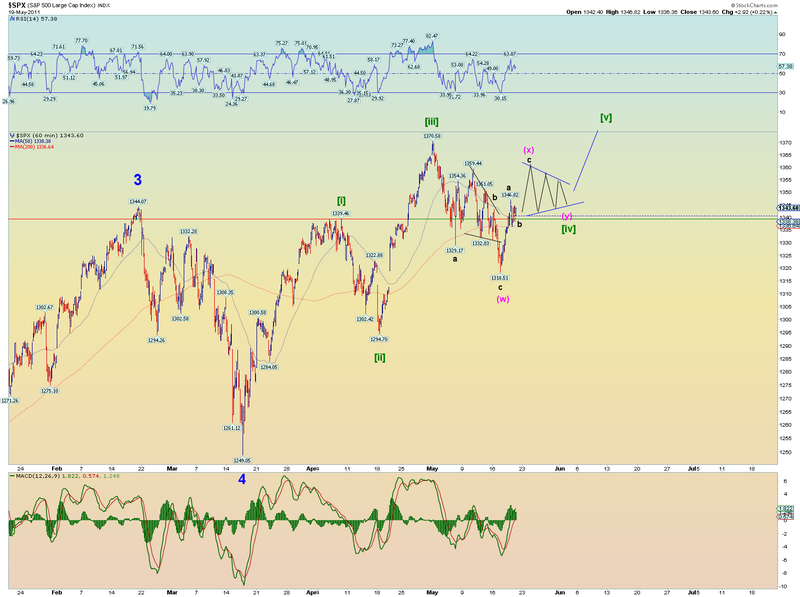 Current leg would be the [d] wave with a price target of 1358 SPX or the open gap spot. 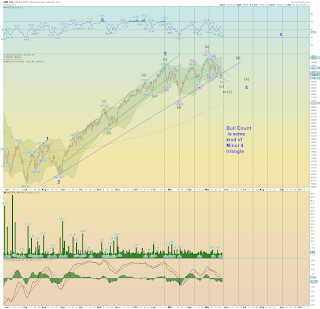 The market perfectly left itself in a maximum state of ambiguity as far as the wave count. 1. 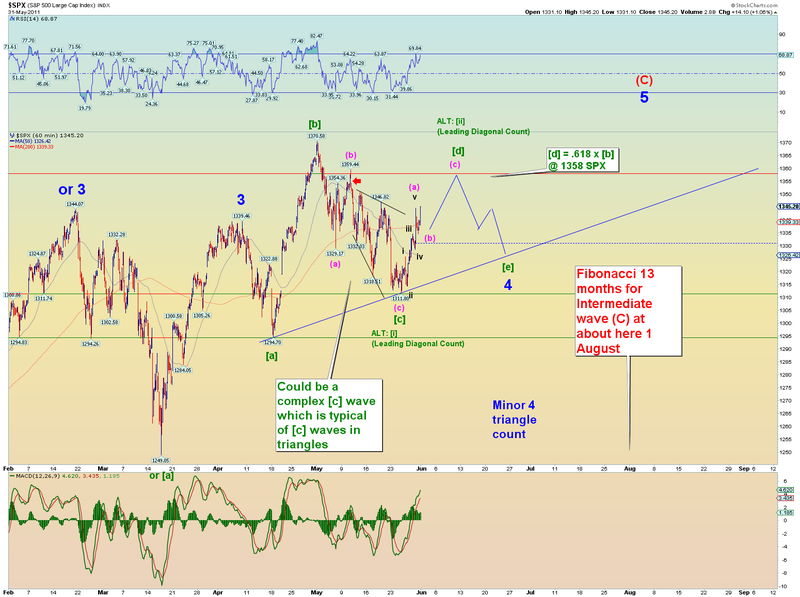 We have 3 waves up so far from the recent support of 1311 SPX. 2. 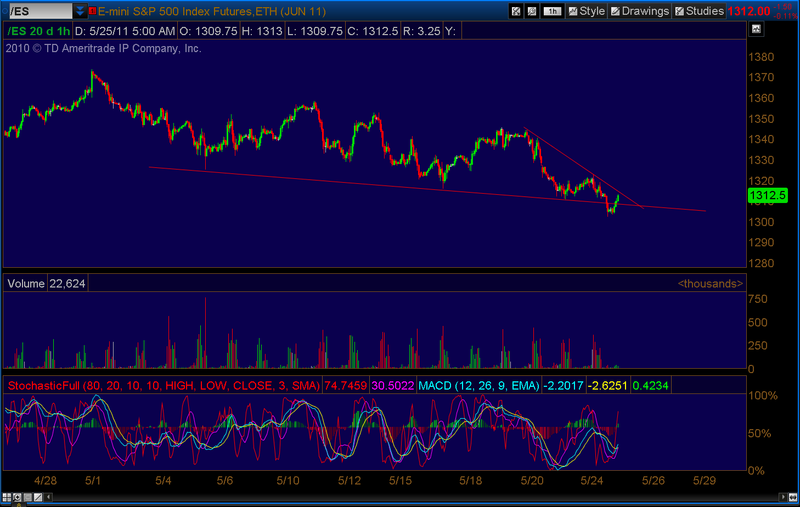 We have the SPX obeying the downtrend line. Tuesday will be important. A higher high above today's intraday peak makes the up move from 1311 a 5 wave move which implies more upside. A breach under 1325 SPX prior to any higher high involves overlap with yesterday's intraday peak which would indicate a three wave counter-move up. 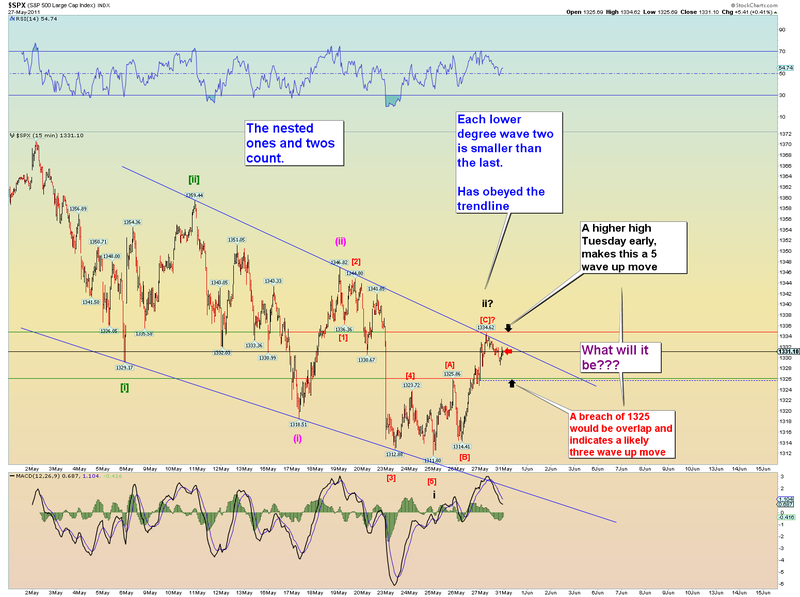 The bearish ones-twos count would have us break down hard. The more bullish Minor 4 triangle count would have us pop up early confirming a 5 wave up move, and eventually work higher in a 5-3-5 [d] wave zigzag, preferably to our Fib target of 1358 SPX which would about close the open chart gap down. What is the preferred count? The longer term triangle count is more appealing if only because nested ones and twos such as I have charted never seem to pan out. Also having the market hold up a while longer would alleviate some bearish sentiment readings such as the AAII and some other surveys that have been coming out lately. But yet the bear count is intriguing enough to keep on the board as a count. After all, its still a downtrend until its not. 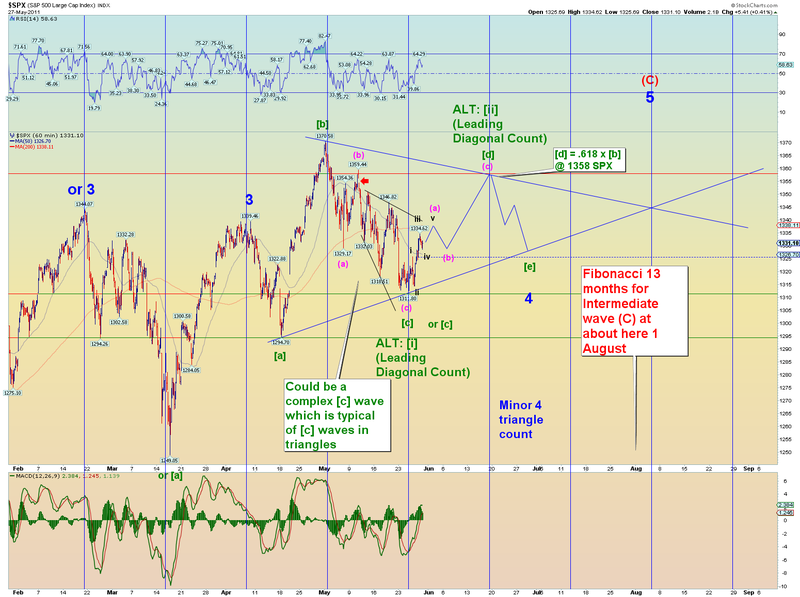 If we get our [d] wave zigzag up, it would look like a wave [ii] in a leading diagonal count wave [i]. To be honest those never seem to pan out either but its certainly a possibility too and is on the radar. 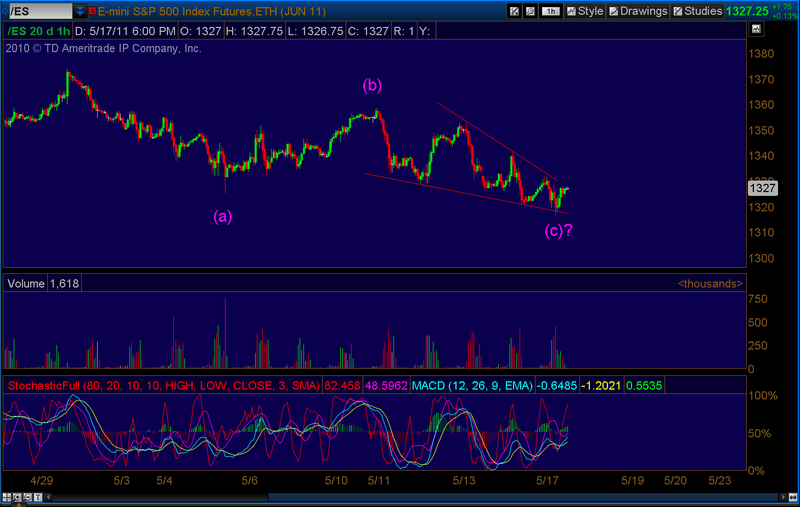 How about this: If we do get a zigzag up, and EWI has a Minor 4 triangle as its primary count, we'll call it a LD. 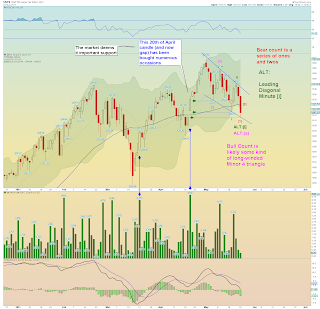 If EWI takes the LD stance, we'll take the triangle stance. Sunday night gap down is closed. [Update 7:39PM: Gold, Bonds, Dollar. You'd think if the markets were about to break down into a "third of a third" down, Gold might have already done so, but it hasn't broken major support either and the count still allows for another high. Admit it, my count on the 30 year was pretty good for many months. Now we are looking for a wave (2) low. Time-wise looks good. A rise above blue 1 likely means a reversal higher. Still room for one more down wave. Big question mark here. 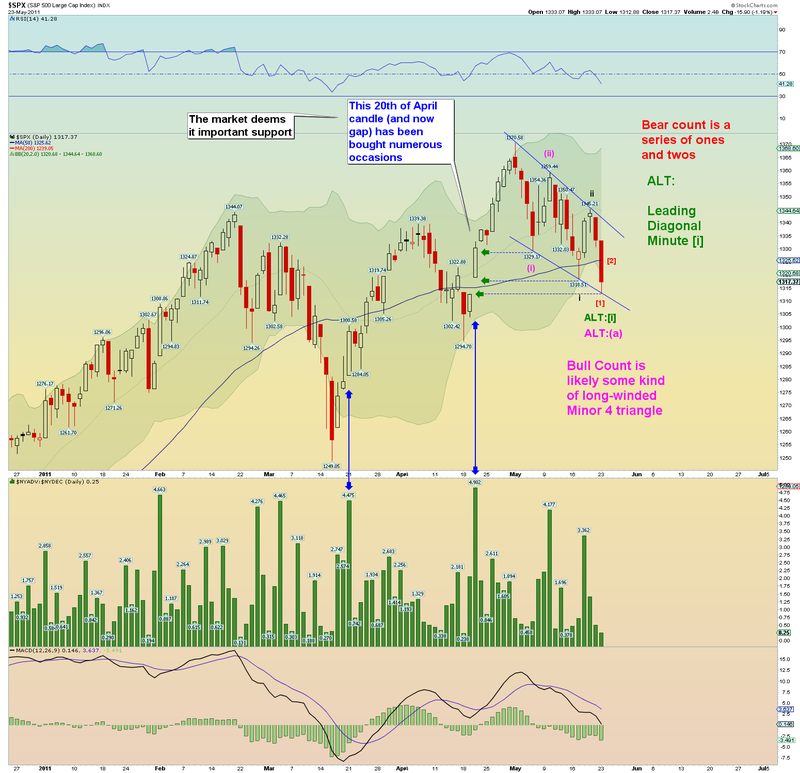 I would love to see a new low in a big freakin falling wedge. Notice time-wise that probably wouldn't be until August. 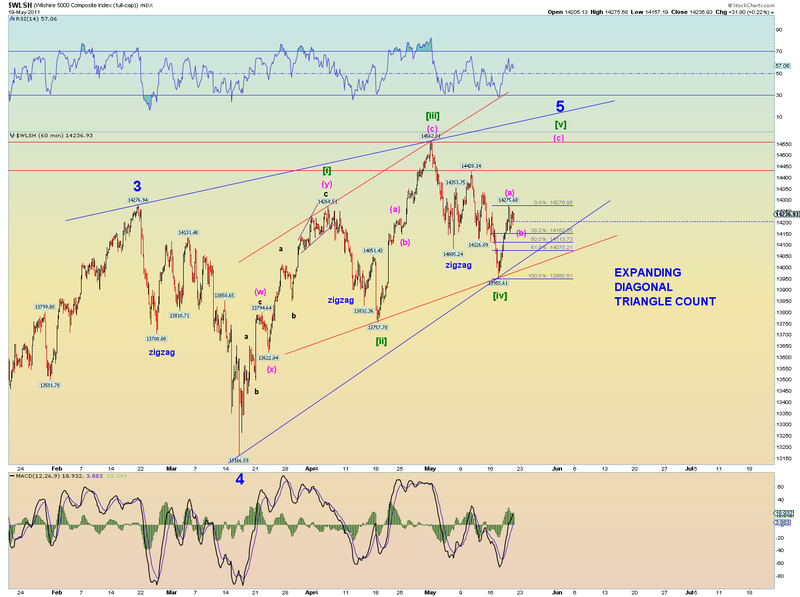 That aligns with the Minor 4 triangle count I showed on the SPX earlier. Market internals strengthened today versus yesterday. 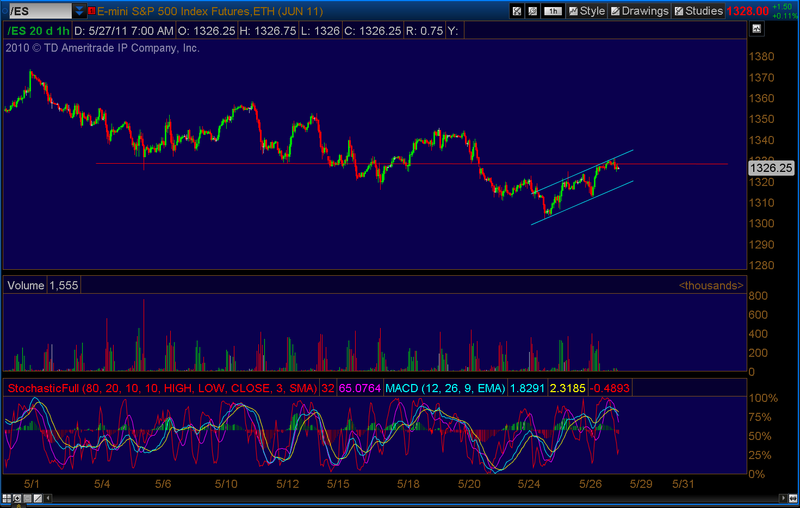 Support at 1312 once again held and this time the rebound was vigorous after this morning's test. 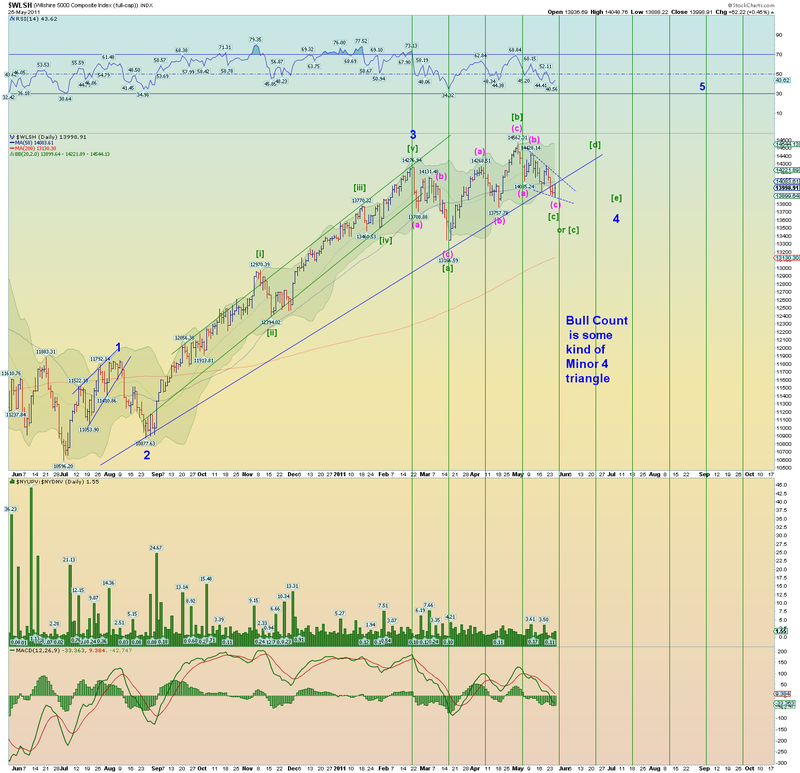 A minor 4 triangle count would probably allow the markets to maintain prices for many weeks longer. 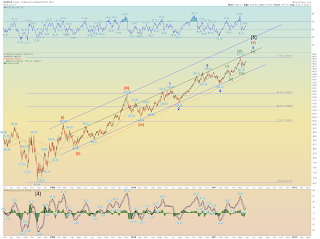 Intermediate wave (A) of P lasted about 13 months. What if Intermediate (C) lasted 13 months? That would take us to about August 1st. 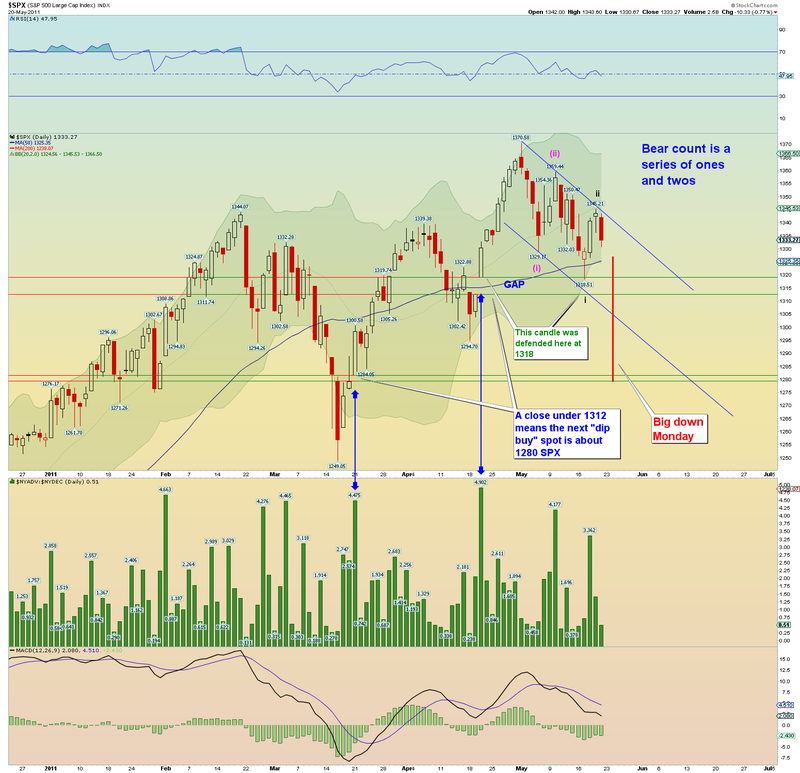 Sentiment is correcting but prices are maintaining above upper support(s). 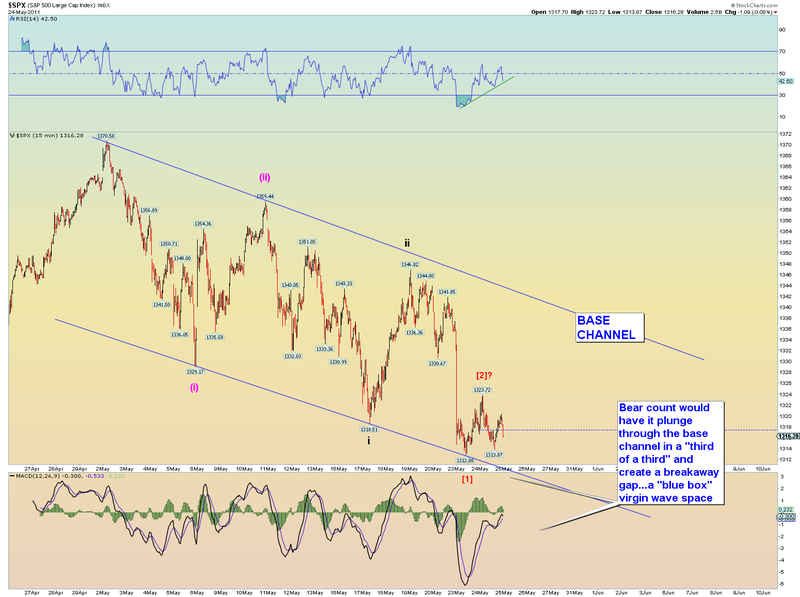 Overall, that is more a bullish situation than bearish. The latest II survey has one of the highest "expecting correction" % in the last 25 years according to Sentiment Trader http://www.sentimentrader.com/ Yet the market is a paltry 40+ points off its high. Prices keep maintaining and as time goes on, the bullish sentiment is being worked off and bearish sentiment is starting to roll in daily. Volatility is also lessening. 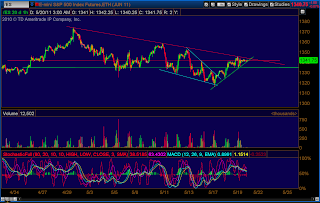 Sentiment getting bearish and volatility lessening could be signs of a triangle. A triangle needs a complex wave and wave [c] usually fills the bill. The waves since 1370 have indeed been complex. 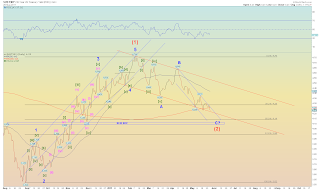 IF ITS A TRIANGLE, IS WAVE [c] OVER? That is the key question. I would say yesterday's failure of the cash index to follow-through on overnight plunging futures is a sign that a small degree "turn" is here. Call it the [d] wave turn. However with that said, I don't have a high confidence count at the moment. At least 1 leg of a triangle usually has a .618 relationship with an opposite leg pair. For instance wave [d] would be .618 of wave [b]. Or wave [e] would be .618 of wave [c]. 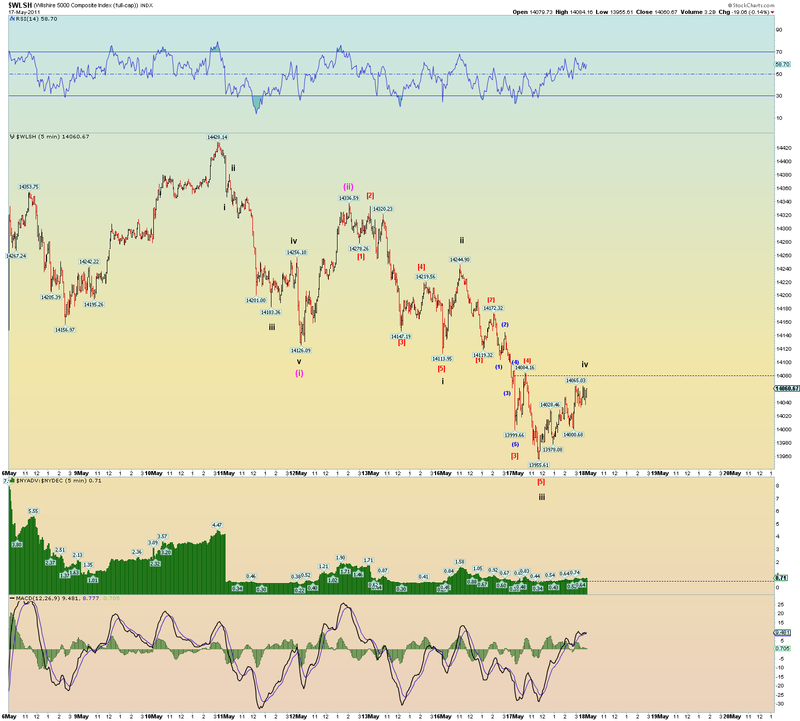 At the moment, 1358 SPX is .618[d] x [b] if the pivots are accurate as it stands now. 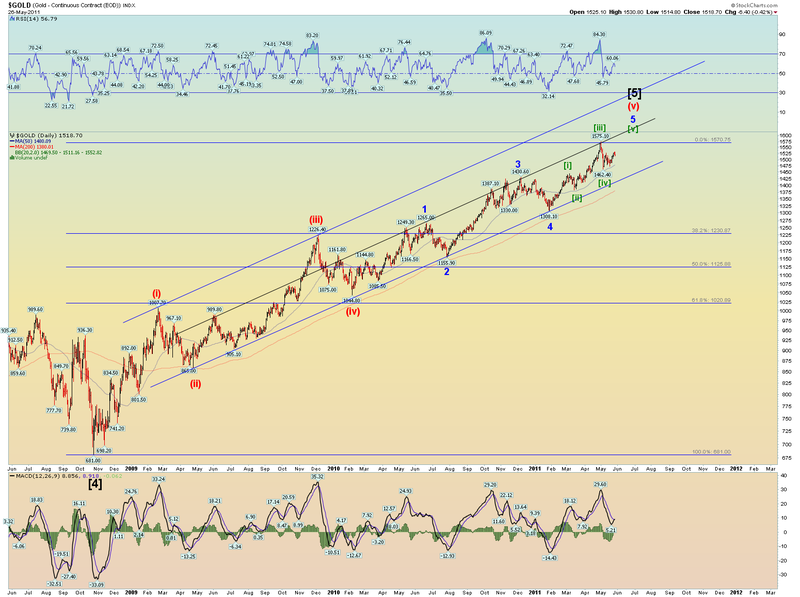 So if 1311 was wave [c] low, 1358 could be a wave [d] target. 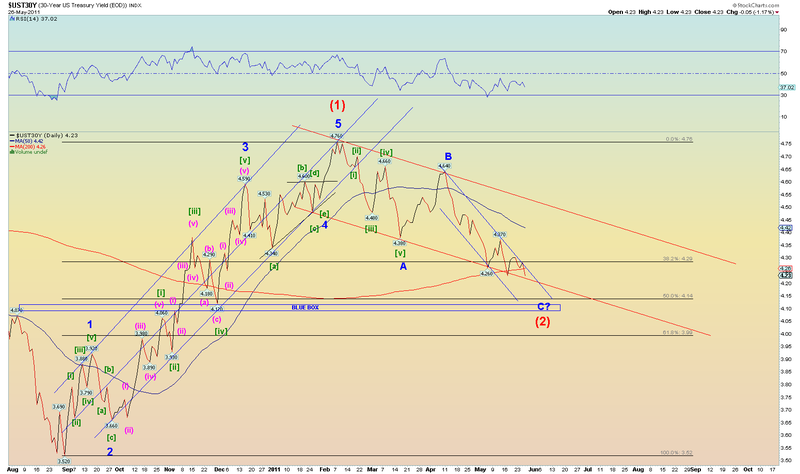 WAVE [e] WOULD BE A POINT OF MAXIMUM BEARISH SENTIMENT. 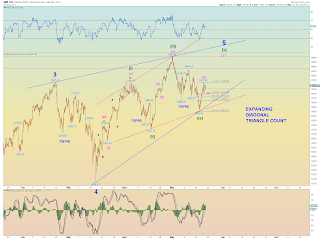 Then wave [e] would be a bearish selloff and produce the maximum bearish sentiment of the triangle. 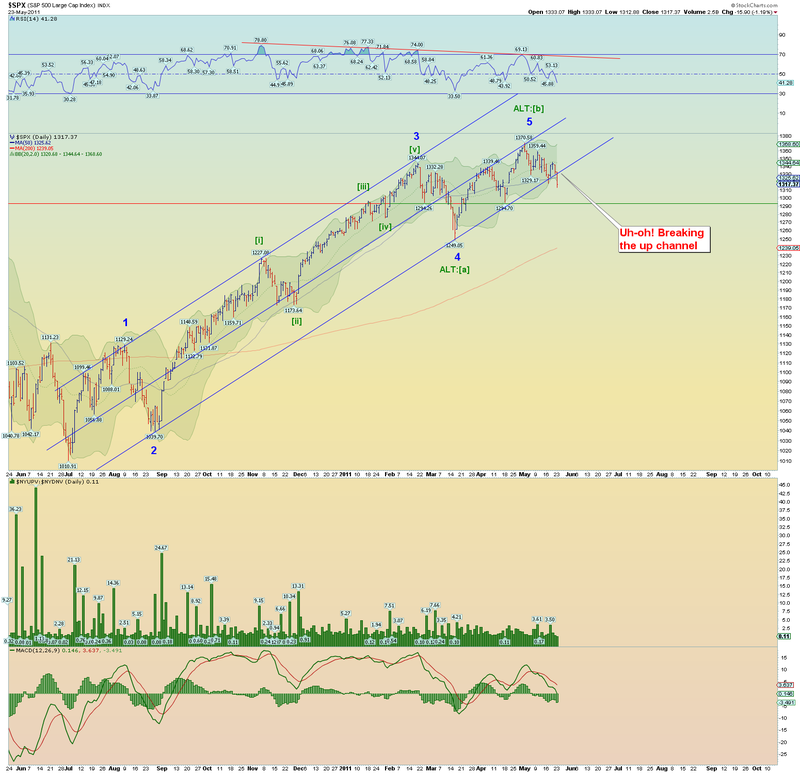 Yet prices would maintain above the wave [c] mark and bounce hard up and catch the majority off guard. The more fugly, the better it works. 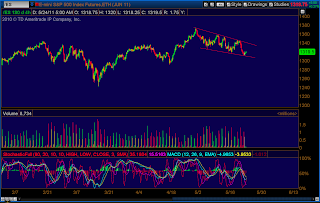 Even non-EW'ers can see triangle price action. 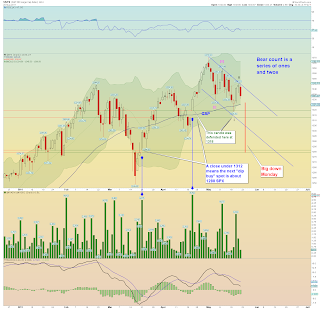 Taking a look at my chart, it indeed does not look like a great triangle. Prechter theorizes that a 7.5 year cycle wave is maintaining prices and the "up" portion could, using math, last as long as another 17 months. But he expects it to turn down early because the 20 and 34 year cycles are both pointing down. One must respect the work of cycles, its not even EW theory necessarily. Whats my point? My point is this: a 13 month Intermediate (C), although bears would hate it, is very much a possibility. What would prices go to? Well, if wave [e] ended at 1324 SPX and Minor 5 was .618 of Minor 1, we would be looking at about 1387 SPX depending on where [e] ended. Until we get some kind of evidence that supports the bearish count (like a third of a third), we have to be patient until something reveals itself. 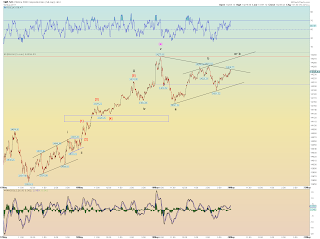 I certainly am not ruling out the bearish count that 1370 is the "top" of P, however, we need some wave action to prove it and pronto. Until that actually happens, each day that passes by above support sentiment gets more bearish and overall that is not what the bears want to see. The final conclusion is that this quarter may end on a high with those fund managers putting every last drop of cash to work in the market. 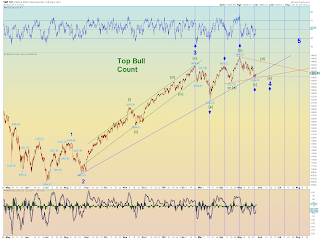 The top bearish count of a series of one's and two's down still remains intact. 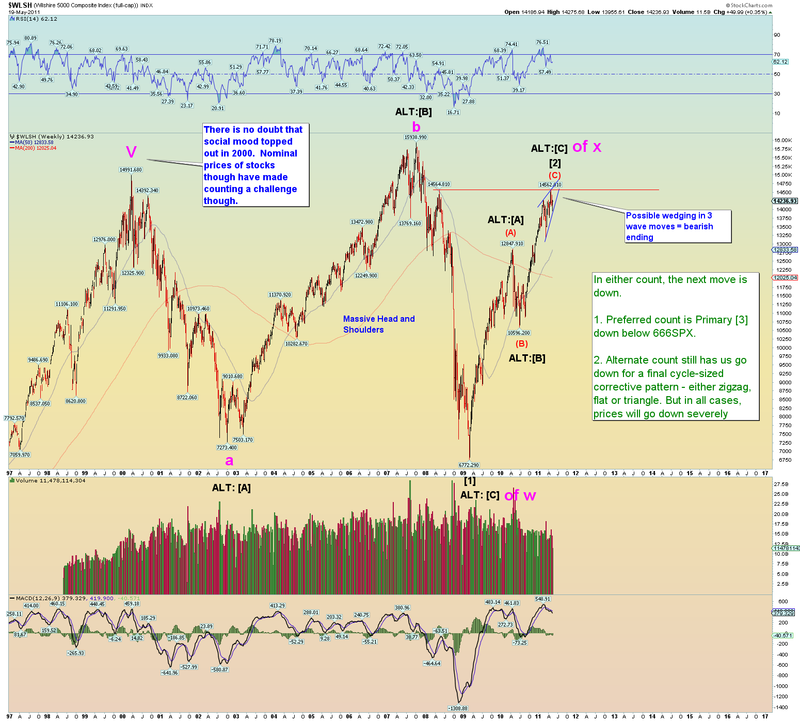 The next leg lower would be a "third of a third" and should result in the most intense selling pressure since the 1370 top. I bumped up the wave degrees one notch versus last night's chart. 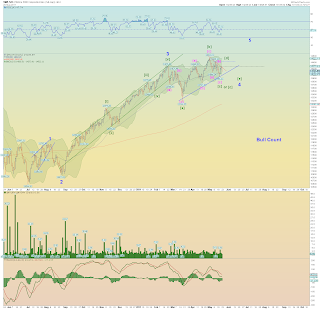 And again, the best overall bullish count (multi-month that is) is some kind of Minor 4 triangle and that we are in a complex [c] wave that may not yet have bottomed. 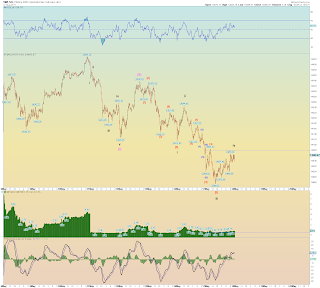 [Update 3:30PM: As per this morning's suspicion, e-mini 1323 was in the bag due to the positive divergence in MACD, etc. 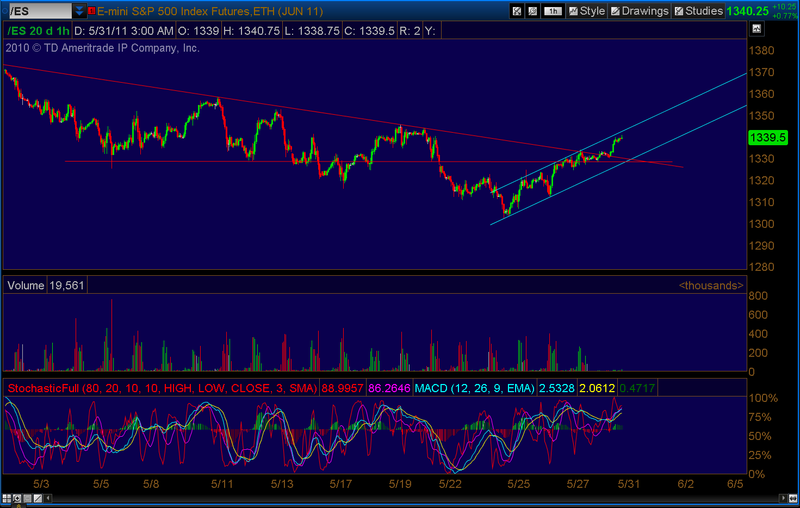 The near term target is 1328.5 where the Sunday night gap down exists in the e-minis. This level corresponds with resistance. Then we see. 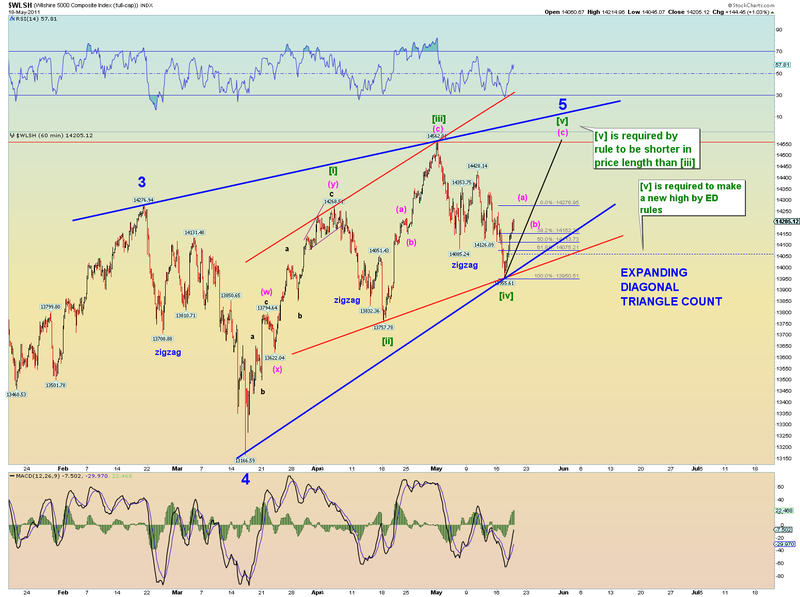 [Update 3:21 PM: The best overall long term bullish count is a Minor 4 triangle still. Playing around with cycles results in some interesting patterns. 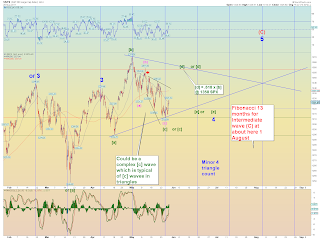 I have the final Minor 5 high timed for a Fibonacci 13 months duration for Intermediate (C). We would need to confirm [c] wave is over and [d] up has begun. [Update 1:50PM: The old adage about support is that if it keeps getting tested, it can break. The series of 1's and 2's down is still a very much legitimate count. We have plenty of headroom here for red  to meander a bit. Although the SPX cash index hasn't followed the e-minis futures down under support, market internals are fairly weak so-so and there is plenty of time left to close the market in the red or if you like, it'll happen tomorrow. I was correct in seeing that the 20th of April candle range and gap was important to the bulls. Call me Captain Obvious. They again defended the very lowest end this monring. And now the 20th of April gap up is officially closed. The rebound, although a temporary relief, has a long way to go to fully correct the technical damage done here above 1312. 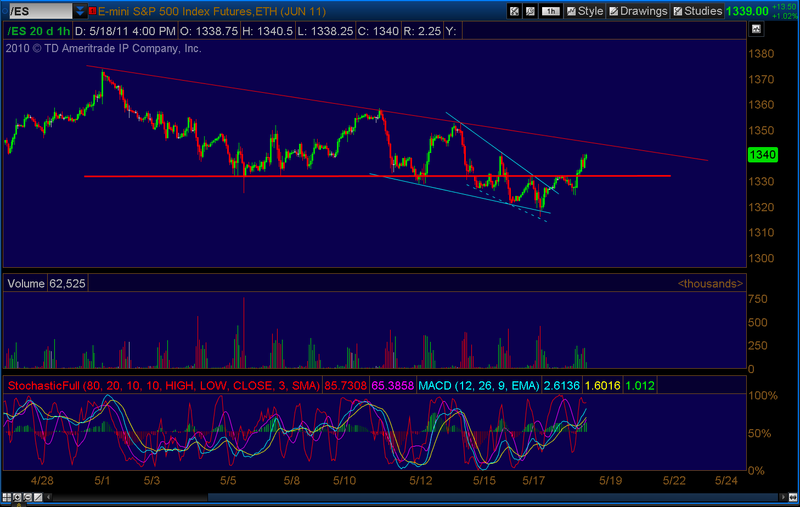 For instance to break the "lower highs" your looking at a market that has to traverse all the way to 1346 SPX. For the bulls, they need to hold the market flat here at least and try for an overnight gap up situation to gain momentum to any upside in a bullish open tomorrow and break some short stops. 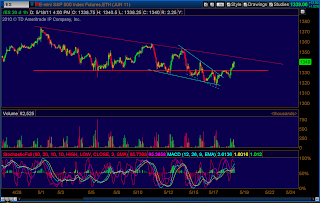 I'm apt to think 1312 will eventually break down here but, as usual, its all about timing. There is a lot of uncertainty and you figure that has got to favor the bears at the moment. We just need some real selling of course. Nice recovery. 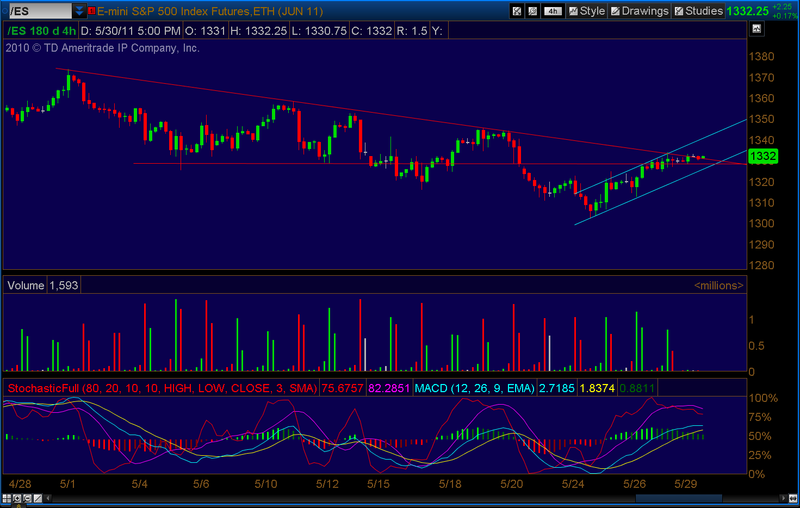 Positive divergence on MACD and stochs suggests we are going back up to above 1322 on this chart or higher. Having the overnight futures plunge like that and if the cash index fails to follow it likely marks a turning point (in this case bullish) even if only at a small degree. 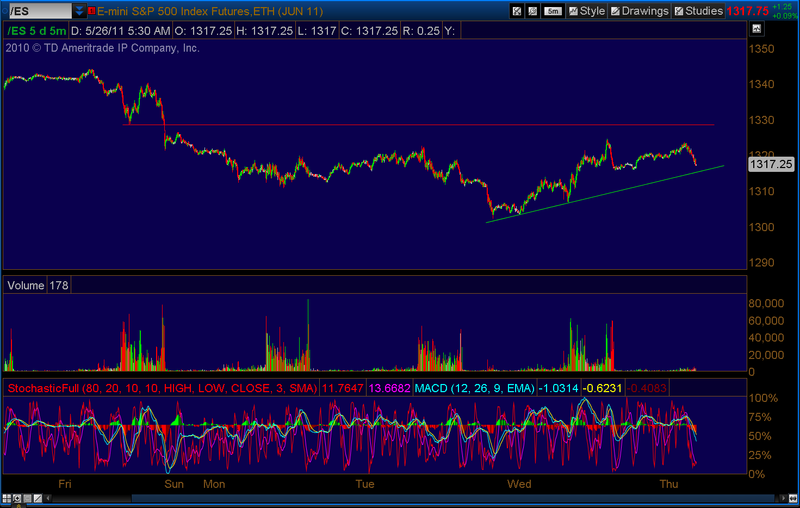 Just like at 1249 SPX the futures had an overnight plunge and the cash index did not follow the next day. Or at the 1370 high the futures got way more bullish overnight and the cash SPX failed to follow the next day although it tried. All these marked small degree turning points. Still obviously a lot of time left and I have to go to work, but those are my thoughts at the moment. 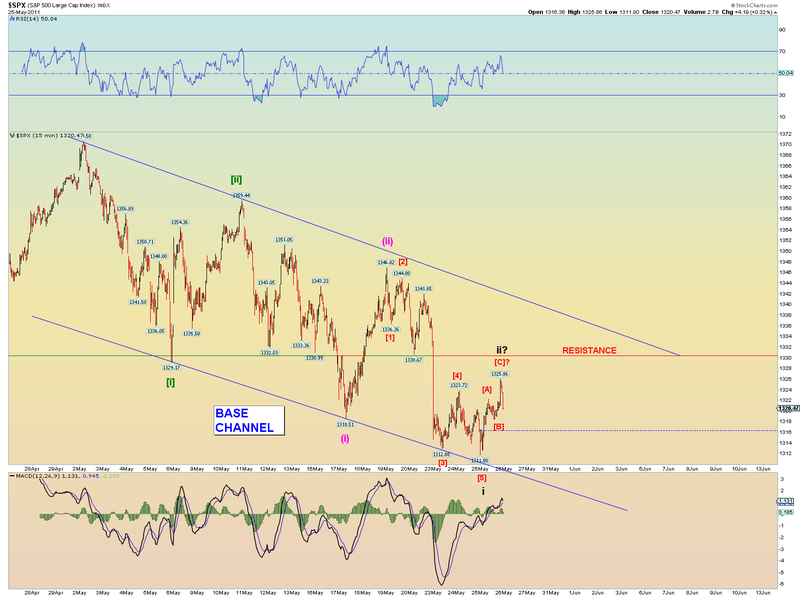 The e-mini gap down at 1328.5 is the short term target for e-mini bulls. After testing the important April 20th candle (or more precisely previous up gap zone) yet again today at 1313.87 SPX, from a bear perspective we nearly have the perfect "setup" if we are to consider a count of a series of (i)-(ii), i - ii,  -  (or each a degree higher - that doesn't matter at this stage). 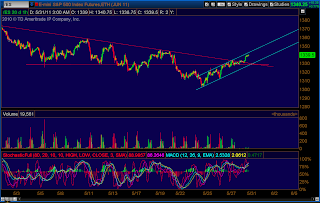 We have a nice base channel that has formed. We have all 3-4 major indexes on the same page - each having a series of lower lows and lower highs and confirming the count. So we have everything aligned for a "third of a third" wave plunge right through major support at 1312 - 1318 SPX even though certain indicators are perhaps in oversold territory still although today certainly helped relieve some of that oversold. Now we just need the market to follow through. At the same time plunging through horizontal support and reversing an important up gap and "breakout" candle (20th April), the market would be decisively breaking the up channel lower line from August 2010. This is the exciting part about EW theory. We have the perfect setup - now we see if our hypothesis count is correct. We haven't really had this good a bear setup the entire P until now. So its up to the market. 1. 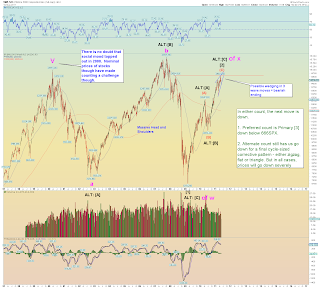 We now have a series of lower lows and lower highs on the Nasdaq Composite and 100, the SPX, and the DJIA. There are no non-confirmations. I guess that makes it a downtrend. There are "five" waves down although they overlap so I wouldn't necessarily count them that way. 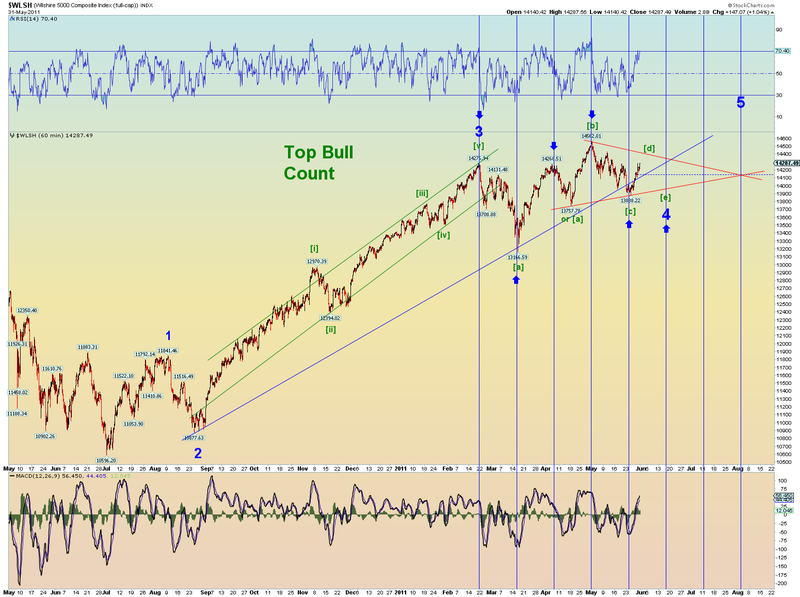 Best bearish count would be a series of 1's and 2's. Then maybe a Leading Diagonal count. 2. The 20th April SPX cash index candle is once again bought, this time at the bottom of the gap (which is actually not quite closed). 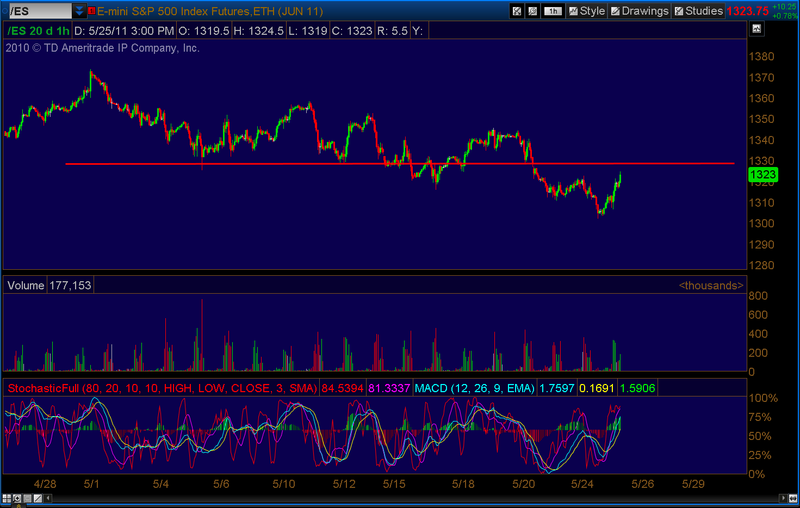 This candle and the support zone from 1312-1318 is deemed important by the market. It was the "breakout" push candle and had good internals and a huge gap up on the cash index. 3. 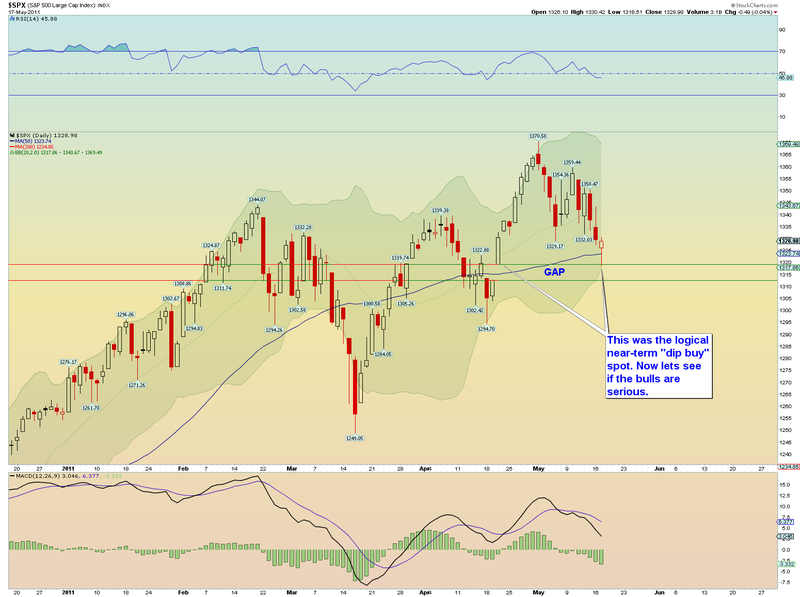 The SPX failed to close above the top of the 20th April gap. 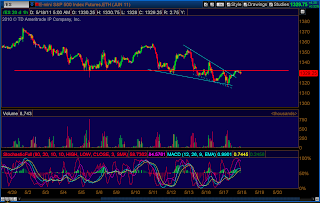 That can be deemed more bearish price action than not. 4. 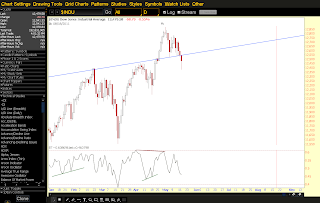 There was no gap down today on the SPX cash index to speak of via Stockcharts. The MM's painted a nice opening 1 minute continuous candle. 5. The best bullish overall count if you prefer one in which 1370 is again bested eventually would be the market is tracing a huge Minor 4 triangle of some sort and we are likely in the [c] wave down. 6. 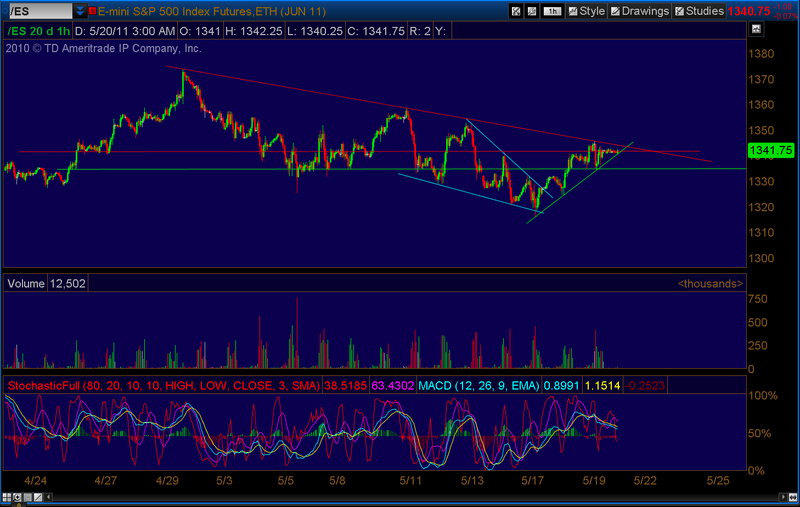 A close under 1312 would have been bearish (reversal of the April 20th candle breakout). 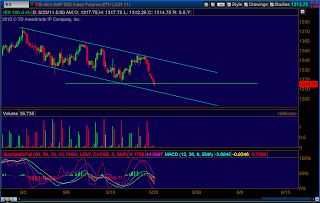 However the market failed to sell-off after the initial first minutes of down. So all in all, the bulls hung pretty tough today and the bears failed to reverse the 20th April candle, at least for today. Its going to take more work tomorrow. 7. 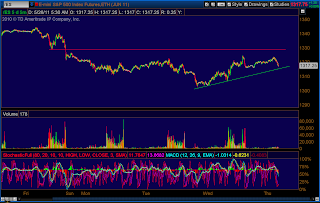 This indicates there is some buying interest at this level still of 1312-1318. Afterall, it is easy to go long at the bottom of the gap. If it "fails" your stop point is just under it for a limited loss. This leads to my next point in that ironically if 1312-1318 support fails, the market may drive down hard and other "minor" supports will fail immediately. The triggering of stop losses at a major support level leads to more losses, margin calls, etc. Flash Crash comes to mind. 9. Today was at least a 90% down volume ratio day on the NYSE but not the NASDAQ (80%) and the down issues on the NYSE were only 80% down. 10. 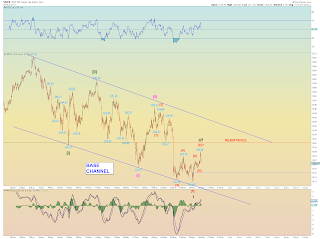 The markets seems to be flirting with breaking the lower up channel from the July 2010 low. I'm not going to beat up the counts tonight. I take a more simplified take on things based on support. 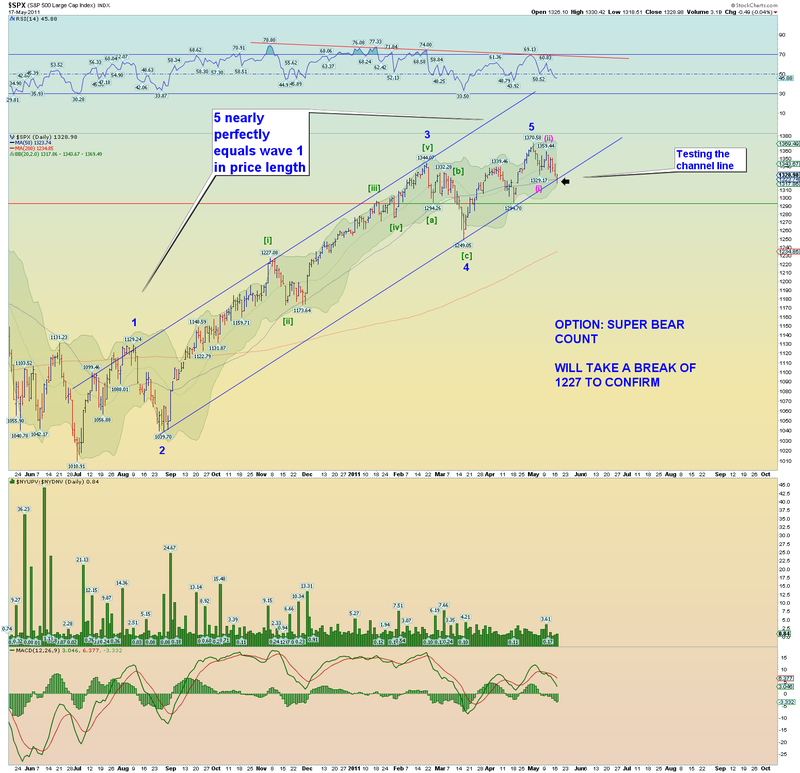 The near-term bearish case is made by the fact that we have 2 lower highs on the SPX. 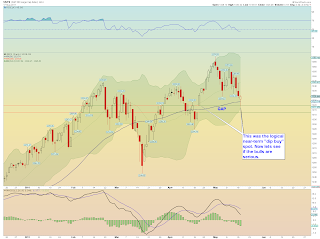 We are looking however for a second lower low. The wave setup would be a series of 1's and 2's down. Thus Monday would be a "third of a third" and thus break down hard under not only 1318 but eventually close under 1312 and possibly head all the way toward 1280ish by Tuesday. 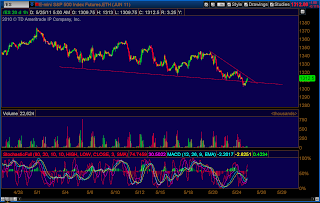 Market internals are also lackluster. 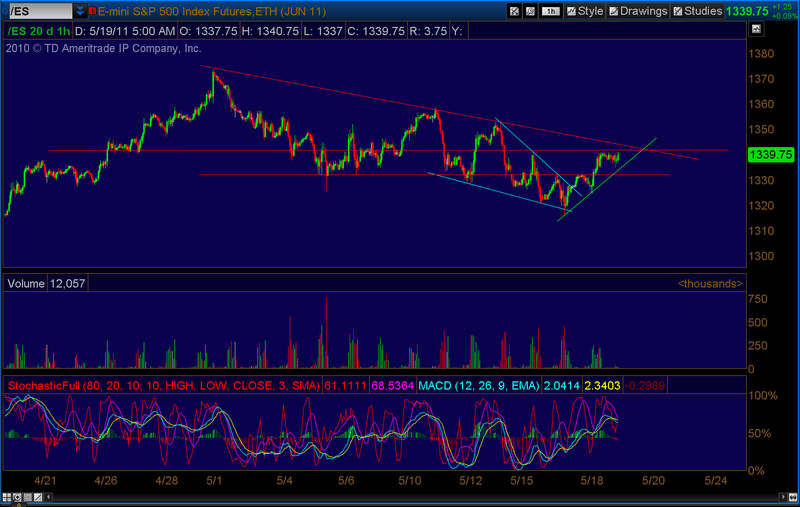 The "dip buy" spot was bought at 1318 but whether this holds is in doubt. 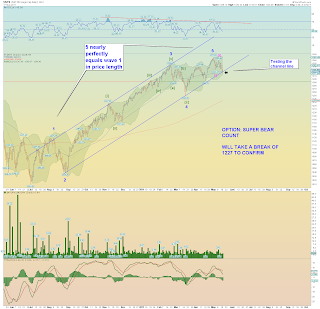 The MM's like to jerk the tape around, thats how they make the greatest profits. 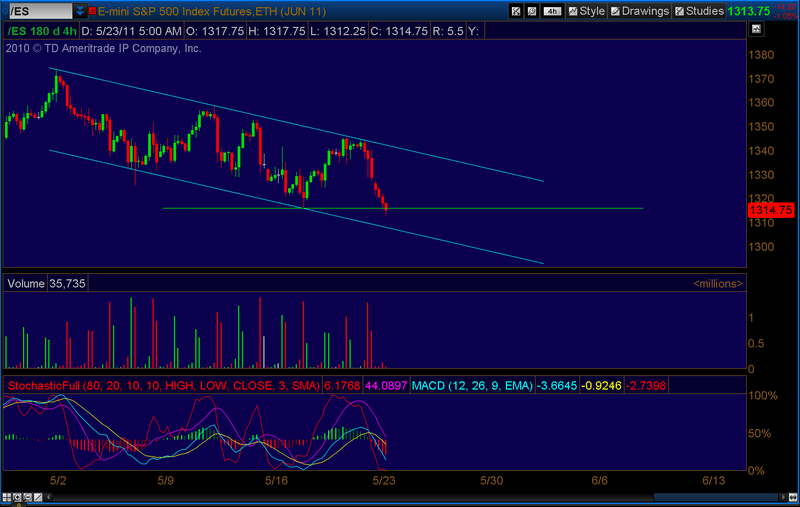 A huge Monday gap down is one typical way they could trap everyone that has been buying above the 1312 mark. 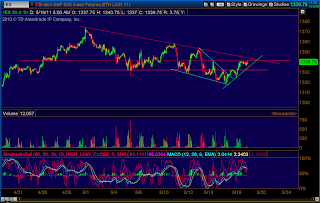 The algo's would then run the tape down to the next logical dip buy spot which is 1280ish as explained above. 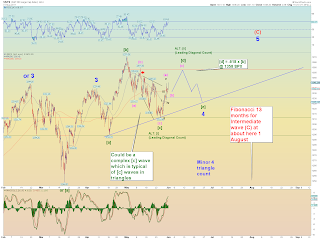 A big down Monday and/or Tuesday would very much strengthen the longer term bearish case if we then get a wave (iv) and (v) later in the week to confirm a larger 5 wave down pattern. The bulls can argue sentiment is not extreme, surveys like AAII have tilted bearish. 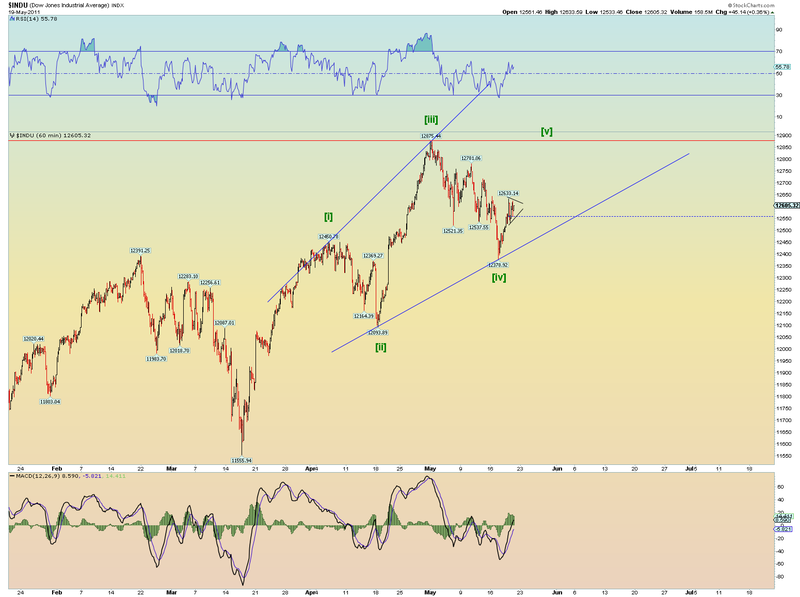 One such train of thought is that the market cannot afford to lose the 1312-1318 SPX dip buy gap. 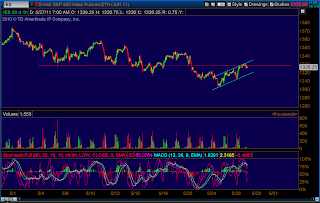 So the area will be bought again on any further weakness. There is also the matter of "unfinished waves" as the market high at this point has seemingly ended on three up which is less than ideal to say the least. 1. My bearish tilt favors the gap down Monday hard just to trap all the dip buyers of the last 2 months with the MM's flushing it all out, but again, I don't get to determine things. 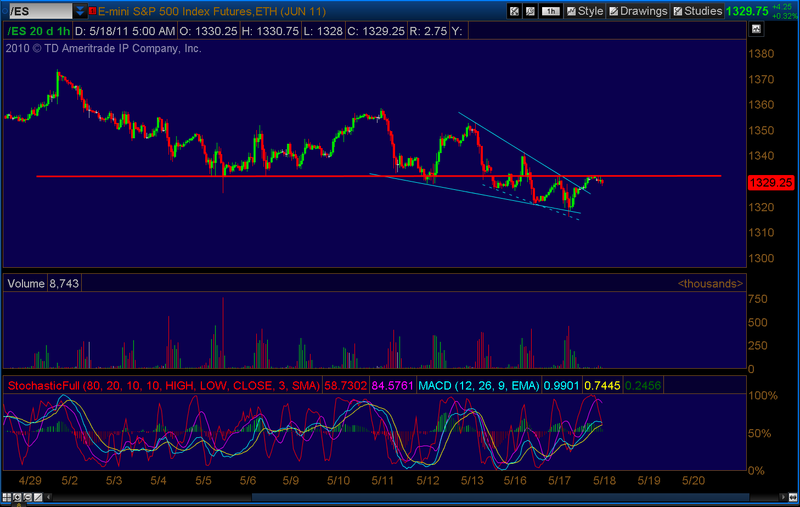 We'll see how futures tilt Sunday night and we'll likely know which way before the market even opens. [Update 5:43PM: EW theory is a theory about social mood. 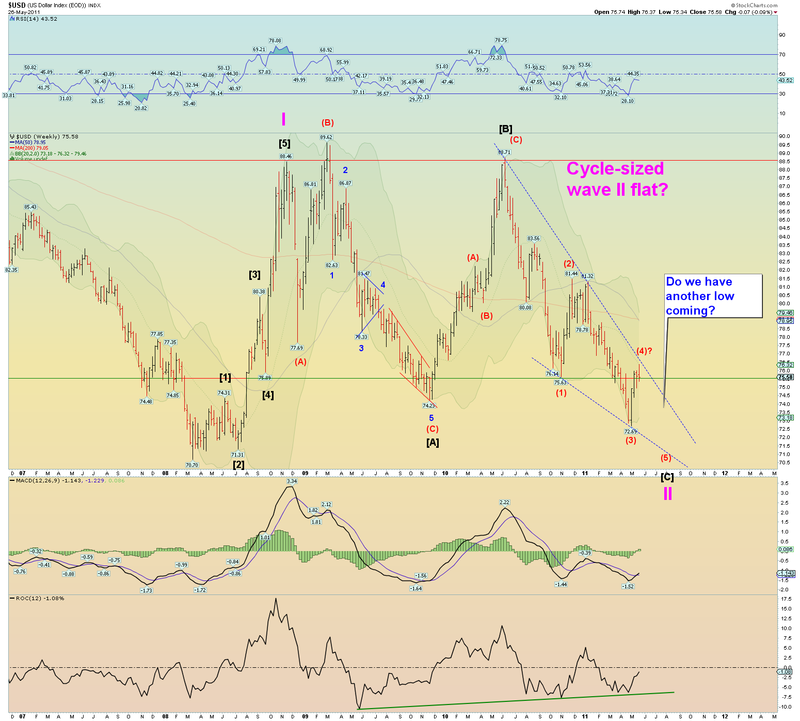 In wave theory, a wave five top, whether it be cycle or even Supercycle-sized, should show positive sentiment at an extreme. This is a basic tenet of EW theory. 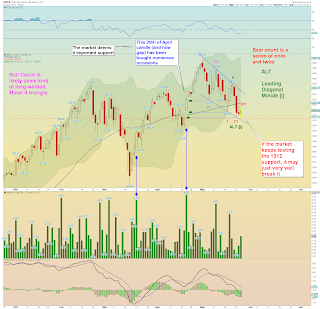 Here are three long-range sentiment charts I picked from Sentiment Trader and added some notes and trendlines. 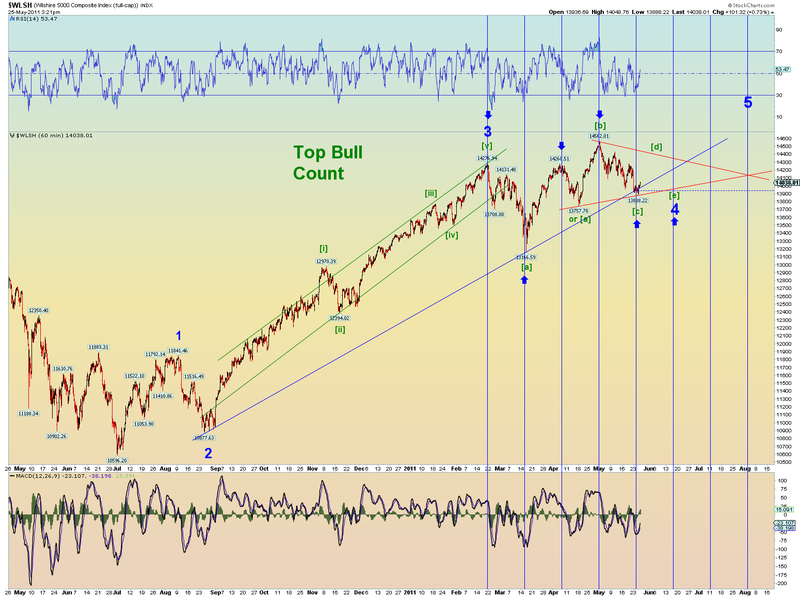 Where do they top in sentiment? All 3 clearly show 2000 as the orthodox "top" in sentiment, thus it is the proposed cycle wave V of Supercycle wave (V) of Grand Supercycle wave [III]. In addition, the DOW/GOLD ratio topped in 2000 by far. If 2007 was the "top", sentiment in these polls should have reflected it. It did not. If the current up trend is a cycle wave V as some propose, then these charts should be expected to make a move toward a new high extreme. But they are clearly not so far. 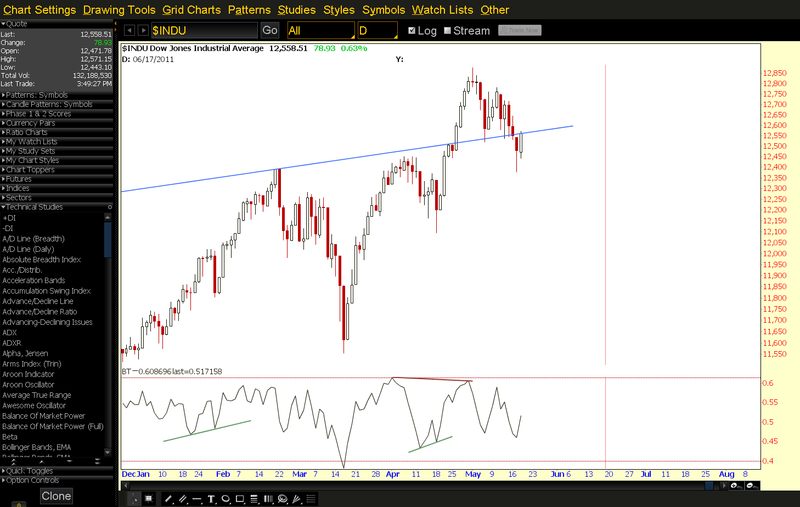 If these charts couldn't make it back to the 2000 high in 2007, what makes you think they will now?? 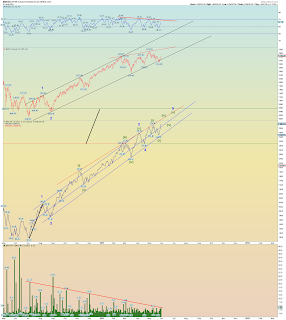 So we are no doubt in a supercycle bear market in social mood and it is expected to get much, much worse. Do you think piling on another 5-10 Trillion in debt will result in a mood shift to extreme positive making these charts go back to their all time highs? I don't. Do you even think we can get away with piling on more debt? I don't. 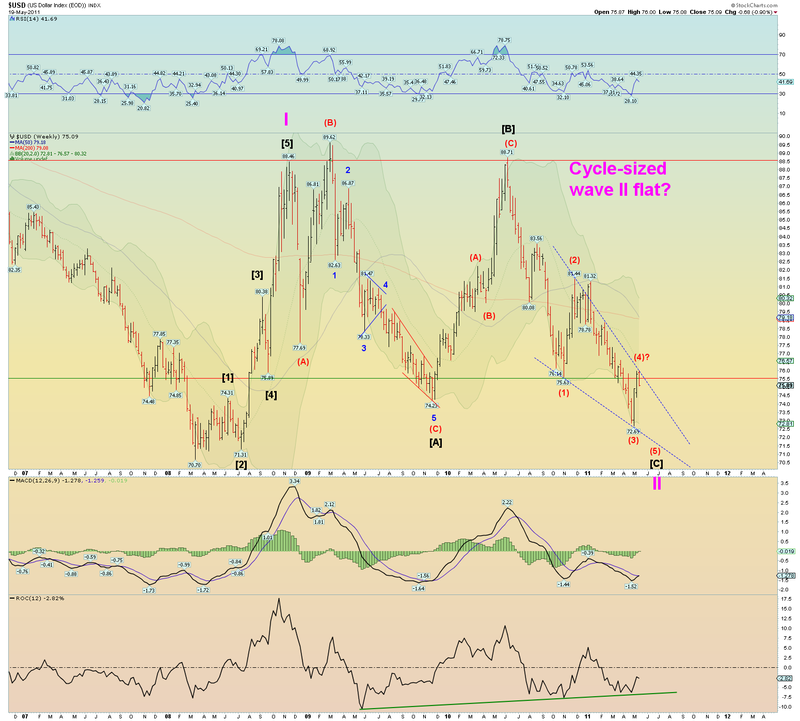 The sentiment evidence clearly shows this is a bear market rally either P or a cycle sized X wave. As many like to knock Prechter, he is properly interpreting social mood and thus the long range counts make sense. I highly recommend his newsletters. Click on my EWI links to the left and become a free club member and get free material. Then if you decide to add a service later on, I would get a small commission based on the service. Prechter's latest Theorist newsletter is very exciting in how he shows the current time cycles and that there is only one cycle holding up mood at the moment and at most, it has another 6-12 months "staying power" and he expects the now downturning larger cycles will exert force and cause this to turn early. [Update 5:17PM: This is a variation on a possible complex wave [iv] pattern that Doc showed in comments. [Update 5:08PM: Here is a long-term count chart. It has my top 2 preferred counts. No matter how you slice things, there is a major top coming. Either P or a cycle-sized X wave. And in either case the best and most common structure for a wave two or an X wave is an A-B-C sharp zigzag such as we have now. So what we are trying to do is find the end of the (C) or [C] wave. [Update 4:48PM: Kicking around a cycle-sized wave II flat with a falling wedge ED pattern. 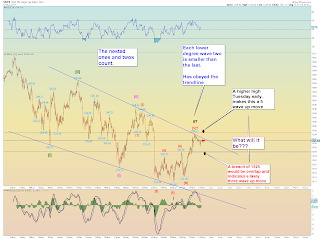 This implies the dollar is not yet done plunging. 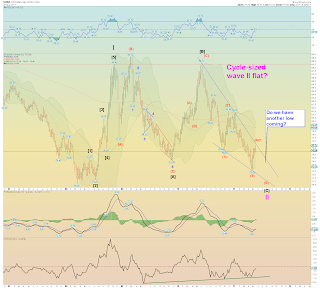 EWI is sure the dollar has bottomed and labeled the cycle-sized corrective as a flat-zigzag-zigzag combination. I am not so sure as they are and hence this chart below. Only time will tell. We'll stick with the expanding ED count for Minor 5 for now. I'm not real thrilled about the count, but at the very least it appears an (a)-(b)-(c) up from 1318 SPX structure is in play. Here is the proposed (a)(b)(c) up structure. 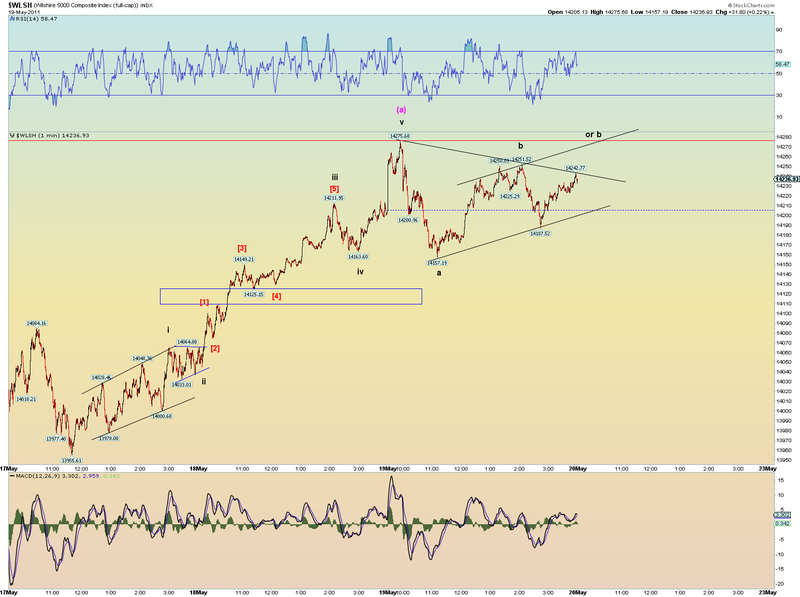 Will the proposed (c) wave up be enough to carry to new highs? 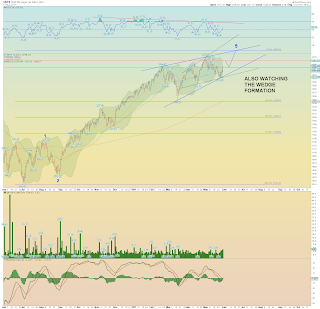 Even the DJIA has the same expanding shape. 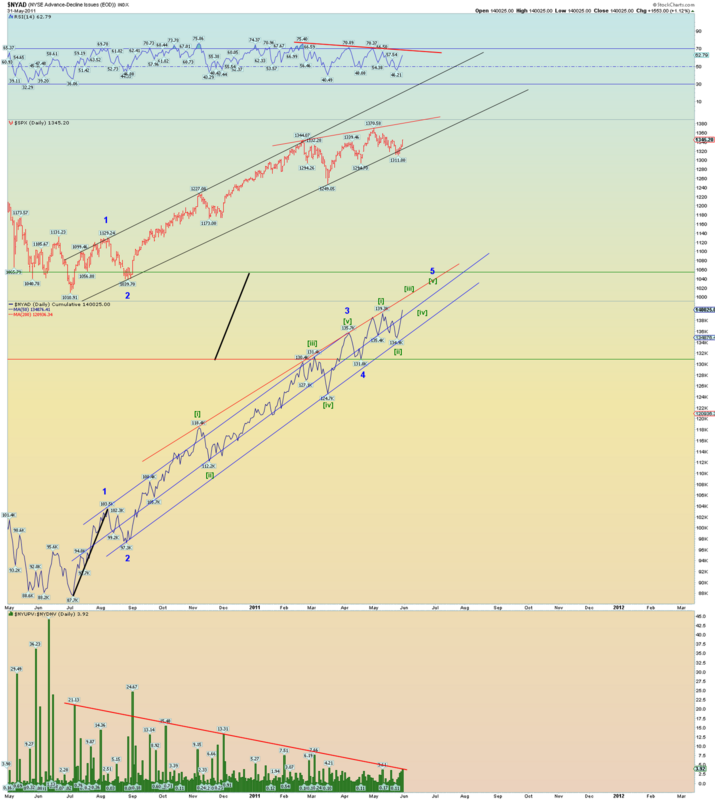 We can probably rule out the truncated ending for P due to the fact that the market does not look yet to be exhausted. Today's internals were pretty decent although not earth-shattering. But price and waveform matters. Waveform appears to be a zigzag down from the high. 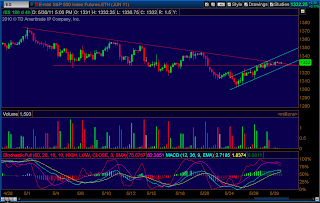 An interesting chart pattern has to be the ending diagonal triangle. On a larger scale we have wedging action. On a smaller scale we have overlapping expanding possibilities. The combination of both is intriguing. Wilshire shows the best form. And another way of looking at the same thing. I don't prefer this as a count because it looks a bit grotesque, however I show it for effect. 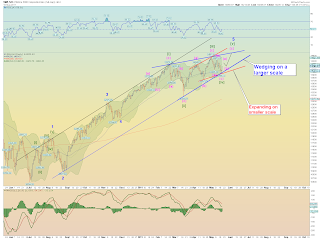 The e-minis actually supports this notion of a new high via the potential bullish falling wedge (which can also be drawn a couple of ways) that resulted in a bullish up move (so far) that re-captured support. Trying to regain lost support. 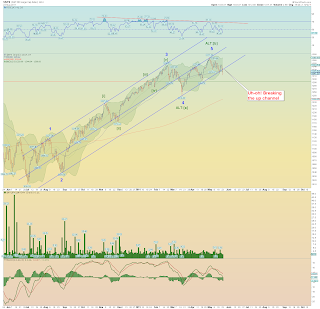 [Update 6:33PM: The DJIA has overlap now and has lost the Supercycle channel line. Things are impulsing decently down on a small scale the last few days. Going to need more of a pattern to complete a larger impulse structure. They bought the gap for now. 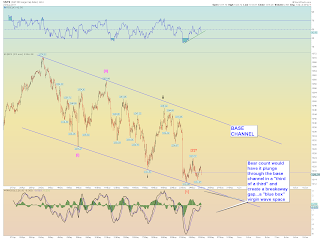 On the other hand, e-minis has made a wedge and still have positive divergence on the MACD signal line.